The chilean rose hair tarantula’s native habitat is the desert regions of Chile. It is a colorful, fairly large, very docile and hardy arachnid. It’s colors can range from gray, to pink, to a reddish brown color. The spider will grow to about a five to six inch leg span. The males will live about five years and females can live as long as twenty years. It has become one of the most common and popular pet spiders. Rose hair tarantulas are available at most pet stores. They are inexpensive, require very little care, and do not need a large cage. 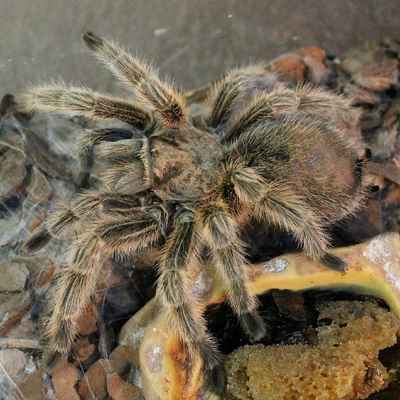 The rose hair tarantula will make an excellent pet for both novice and experienced owners. A five or ten gallon terrarium tank with an under-tank heat pad is a good enclosure for a rose hair tarantula. A substrate of bed-a-beast, a hide area or half-log, and a shallow water dish is all that is required inside the habitat. You can add additional well-secured decorations to your liking. Lighting is not necessary for the tarantula. Gut-loaded crickets, mealworms, or waxworms will be the spiders diet. It should be fed a few times a week and if it does not eat the food it should be removed the following day.